Waggonfabrik Talbot designed the “Talent” platform with the intention of providing for nearly any passenger operation within Europe. Be it a regional stopping, rural trundling or city street weaving service, the Talent was able to offer up a configuration to achieve. The Talent was available in a variety of diesel power types and also electric for work under the wires, allowing for a higher top speed. The units were also susceptible to internal changes, various passenger luxuries such as a choice of floor height, number of coaches and a multi-purpose area were all options for operators. Despite the design being completed in 1994, Talbot was taken over by Bombardier in the following year and the first models off the production line were subsequently built by them. One of the first operators in line for Talent units was Deutsche Bahn, who ordered a diesel-based fleet for use on local, regional services on routes without electrification. DB’s new fleet was classified as the BR 643, and was built in 3-car formation to provide suitable capacity on quieter lines. To keep the journey comfortable, the coaches share Jacobs bogies which keeps vibrations to a minimum and also improve the unit’s safety. 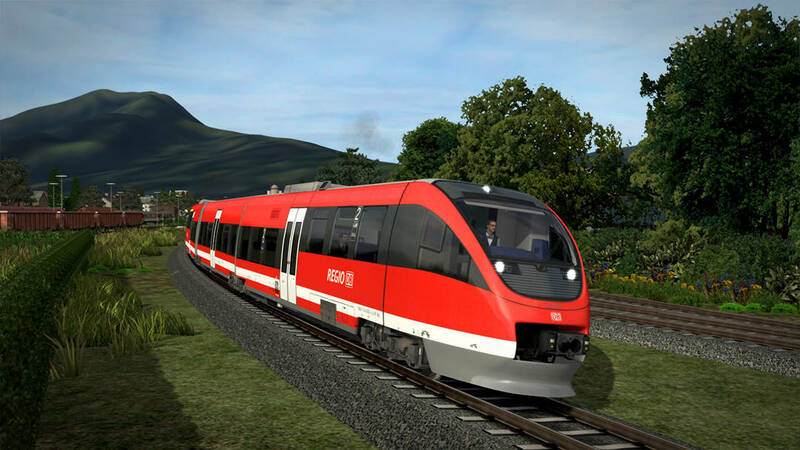 Coming soon to the Steam and Dovetail Games Stores, the DB BR 643 from RSSLO captures the finesse of the Talent in Pro Range fashion, and with it you shall provide local DB Regio services across the scenic Allgäubahn route.